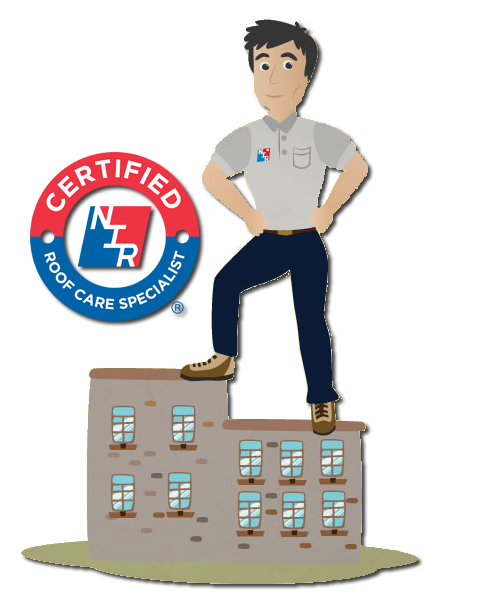 NIR Roof Care, Inc.® > About NIR > What is a Certified Roof Care Specialist? What is a Certified Roof Care Specialist? Manufacturers have multiple factories running 24 hours a day with distribution centers all over the world. They have to sell roofing materials to stay in business. Although they position themselves as a solution with a list of licensed roofing contractors to take care of your problem, the fact is that they need to sell roofing materials or their companies will go out of business. They create roofing licenses with roofing contractors and require them to buy materials or have their licenses canceled. Consultants sell their professional services as independent third parties with expensive reports, yet do not fix your roof. They seem like they know more than the roofer does, but they have never actually installed a roof. They work with manufacturers to promote their materials. They are often biased to certain manufacturers and regularly recommend a small group of roofing companies to get bids from. This does not result in the best deal for the building owner. Old line roofers want to sell the highest price solution to make the most money. This is not the best way to buy a roof. They may have a service department and send out a foreman to fix a leak when he is not installing a new roof where the real money is made. A different guy comes back each time there is a leak, and it takes time for him to get up to speed and learn about the specific roof on which he is working. 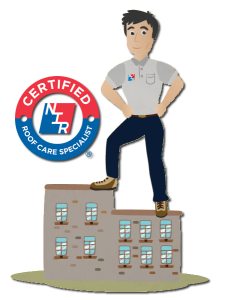 NIR Roof Care has combined the old roofing line into one “superhero” type person known as a Certified Roof Care Specialist. In 1987, NIR launched the NIR University of “NIR-U” to train qualified roofers how to take proper care of a roof. At the time, this was unheard of. Until then, salesmen had been the ones who sold roofing. But the founder of NIR understood that roofers know more about roofing than salesmen do. NIR also recognized the value of roofers who had experience and searched for roofers with at least 10 years in the industry. A Certified Roof Care Specialist will show you how NIR’s service agreement for regular maintenance will extend the life of your roof and save you money. All these benefits help you have peace of mind, knowing that the roofs on her buildings are being properly maintained. Having a dedicated Certified Roof Care Specialist coordinate all aspects of the care of your roof is like having the same doctor oversee your every medical need. Each time a Certified Roof Care Specialist returns, he becomes more and more familiar with the roof. He starts to know where potential problems may arise and is able to closely monitor those areas. As your Certified Roof Care Specialist continues to work with you and your staff, that relationship brings about more peace of mind. NIR will hold off the old roof line from taking a large portion of your’s capital and reducing the equity in your building. Roofs cost tens of thousands, hundreds of thousands, and even into the millions of dollars. They must be regularly maintained, not hastily repaired when it is too late and there is an emergency. Regular reports and contact from their Certified Roof Care Specialist will help building owners to better plan their budgets and be more knowledgeable about the condition of their roofs. Ongoing costs of roof repairs go down when a good roof care program is in place. Studies have shown an average of 20% savings in overall roofing costs by utilizing NIR’s Roof Care Plans. “I have been a roofer for 16 years. All have been with NIR. For the last 14 years, I have been a Certified Roof Care Specialist. Being a CRCS has given me the ability to do what I enjoy: problem-solving. Many times I have created a solution other roofers have been unable to see. “Pat, from NIR has taken care of our roofing needs for the past 15 years, performing everything from maintenance to common leak repairs, including countless improvement projects. Pat has proven to be an excellent, hard working, well qualified/recog­nized contractor with top roofing skills who performs his work with great care through completion.